Hydro Hotel is rich in history and reminiscent in tradition. Originally opened in 1895, Hydro Hotel has been taking care of guests for over 120 years. The hotel has built up a long-standing reputation for fine cuisine, an unforgettable dining experience and personal service. The Company was incorporated on the 4th July 1895 and carries on the business of hoteliers. The building has been developed 120m above sea level on a three acre ground. A side-wing was developed for the beautiful Art Deco entrance and lobby. The Hydro Hotel welcomes in 2017 the first outdoor function room that can cater for up to 120 guests. Catering to the wealthy industrialists from London, Hove and Seaford, this elegant Victorian hotel, with its breath-taking views of the English Channel is now an elegant hotel and conference centre. 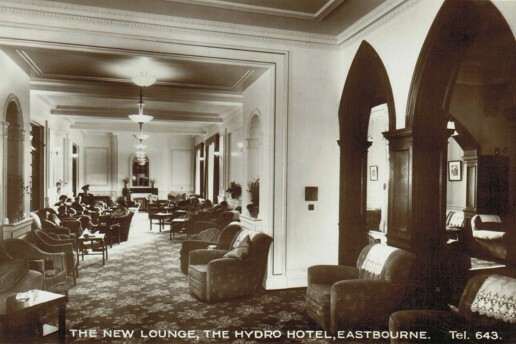 Hydro Hotel was formed by the Eastbourne Hydropathic Company Limited, a company incorporated under the Companies Act, 1862 to 1893, by purchasing the freehold residence and grounds known then as the Marine Mansion. The property was and still is situated in one of the finest positions on the South Cliff of Eastbourne, with a southerly view, facing the Parade and was only a few minutes’ drive from the railway station. The hotel was build facing the sea, 120 feet above sea level to ensure inspiring views of the English Channel, Beachy Head and the South Downs. The grounds were laid out with relaxation in mind and originally featured a tennis lawn, terraces, beautiful shrub embankments and a variety of walks. 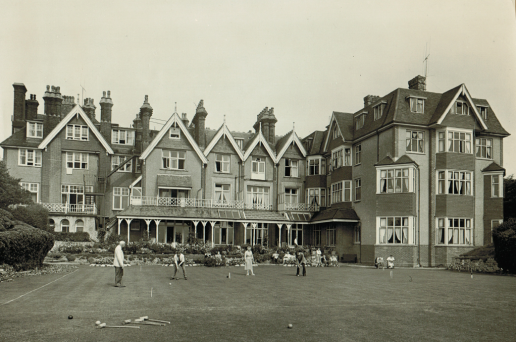 Built seven years prior to being purchased by the Eastbourne Hydropathic Company, it was known as one of the largest of the many picturesque residences in the town. The workmanship and material employed in the building were of the finest quality. The ground floor which was of polished oak contained the entrance vestibule, large central hall, drawing room, music room, morning room, garden room, dining room, cloak room and the winter gardens. The wing on the left-hand side of the building contained a large recreation hall, all being perfect for its adaptation into a hydropathic establishment and a residence for visitors. The Directors were Henry Habgood, William Hicklin, Paul Merrit (Author of The Hollies), W.L. Wallis (The Wish) and Arthur Earnest Wynn, the Director of the Cairn Hydropathic Company in Harrogate. 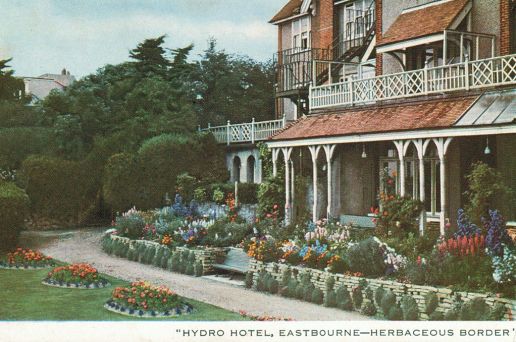 Due to the success of the Cairn Hydropathic Establishment under Mr. Wynn’s management, despite having only a short season of three to four months per year, Eastbourne was chosen for its perfect sanitation, salubrious air and its sunny weather, making it a winter as well as summer resort. Two English works on the medical uses of water were published in the 18th century that inaugurated the new fashion for hydrotherapy. One of these was by Sir John Floyer, a physician of Lichfield and the other work was a 1797 publication by Dr. James Currie of Liverpool on the use of hot and cold water in the treatment of fever and other illness. Captain R. T. Claridge was responsible for introducing and promoting hydropathy in Britain and Ireland, first in London in 1842, then with lecture tours in Ireland and Scotland in 1843. From the 1840s, hydropathics were established across Britain. Initially, many of these were small institutions, catering to at most a few dozen patients. By the later nineteenth century, the typical hydropathic establishment had evolved into a more substantial undertaking, with thousands of patients treated annually for weeks at a time in a large purpose-built building with lavish facilities – baths, recreation rooms and the like – under the supervision of fully trained and qualified medical practitioners and staff. Thus, Hydro Hotel was established and still runs today.